The humorous (and amorous) map appears in the 1892 Index, the first edition of the student yearbook. "Prep's Directory" as it is titled shows familiar locations and streets (e.g Sugar Creek, Cherry Street, Fell Street); places that have long since disappeared (e.g. Old Main, the Model School, and the Livery); and many places that existed only in the artist's imagination or in a the collective college student imaginary of the day. What these places meant to the artist and his colleagues, we will likely never know. The Old Main Project has focused on capturing the reminisences of alumni to discover the informal history of Old Main and "Old Normal," as the campus was sometimes called. 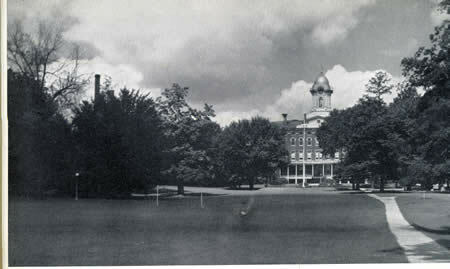 Our oldest interviewees attended ISNU in the 1930s. Thus most of our stories take place during those years. 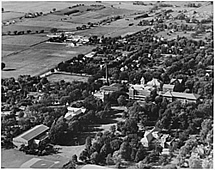 In 1938, ISNU reached a pre-WWII peak enrollment of 1,973 students. Enrollments had grown steadily over the previous decade, and the campus had struggled through the Great Depression to educate more students with scarce resources. Enrollments dwindled in the early 1940s due to the War. The gender composition of the student body shifted as well. Men, who had largely left the profession in the 1920s, returned to teaching and to school when the Depression hit. They comprised 38% of the student population in 1935, and nearly half of the senior students were men. With the outbreak of war in Europe, a large percentage of men, and some women too, left school for the war effort. 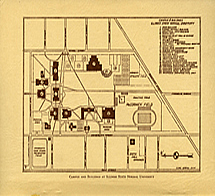 Though most of the campus body consisted of white, Protestant students from Illinois communities, African American and other minority students were present on campus since at least the late 19th century. WWII brought, for the first time, greater geographical diversity to the campus with the establishment of a naval aviation training program and the arrival of hundreds of naval cadets from across the nation to ISNU’s campus. 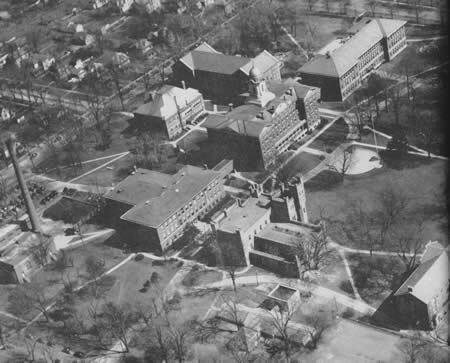 As seen in the map and photo to the right, the principle buildings on the campus besides the Main Building by 1940 were those that are today known as Cook, Edwards, Moulton, Fell and Williams Halls. Williams Hall, originally Milner Library, was brand new. Other buildings such as the Practice School, later called North Hall, and Smith Hall, a women’s residence do not exist today. Photo from the 1938 Student Index. Photo from the 1941 Student Index.